On the week we give thanks and celebrate Thanksgiving…. throughout the college football world, along with a side of sweet potato pie of course. Not that we aren’t thankful, nothing could be further from the truth…. This isn’t about being “Thankful”…. It is about Clean Old Fashioned Hate…. And the Legends of the fall that come from such games live forever. Let’s take a look at a few of the games we have in store this week….. The Name alone says it all…. These two fine University’s students, fans and alumni hate each other with a passion. and all it’s fine accomplishments as well as to encourage prospective students to attend the university in College Station Texas. On the cover of the fall catalog was a collage of pictures of campus life at Texas A&M, from students studying outside, walking to class, football games at Kyle Field, two students with goggles studying in the chemistry lab, but one picture on the cover was “different”. In one picture a young lady in the Aggie Marching Band was playing the flute. that it appeared she was making the “Hook Em Horns” sign. 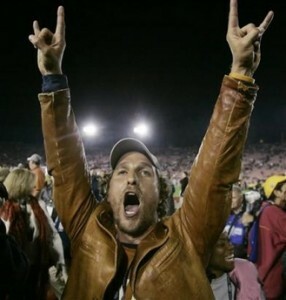 Please see the example of the proper “Hook Em Horns” sign below delivered by my buddy Matthew McConaughey. be recalled and a “new” edition reprinted without the accursed picture on it. for the Mighty Longhorns from the University of Texas at Austin. and even before that, there were hard feelings and hate. The feelings are mutual and have festered over the years. Sons of…you can figure out the rest of that on your own. This rivalry isn’t as intense as it once was…. to the beautiful mountains of West “By God” Virginia. who are willing to burn their “own” couch in their front yard after a win over a hated foe. If you are looking for hate, passion and discontent that has no expiration date then look no further than the “Egg Bowl”. In the Great State of Mississippi with poultry the current king of agriculture…. the Egg Bowl takes center stage this weekend and the rivalry has never been more intense, if that’s possible. There will be harsh words, fights and more fights……. and that’s just in the parking lot before the game. Make no mistake, this game is intense and emotions are raw. These two states, schools, fans, and alumni hate each other, period. But trophy or no trophy, they just hate each other. there was a popular bumper sticker seen throughout Arkansas that I thoroughly enjoyed. I know this is “Big” deal in the State of Washington…. But let me clue you all on in a little secret….. This is a relatively new rivalry as rivalries go; it began in 1958, when Coach Bobby was only 61 years “young”. But this game is no less intense than older more established rivalries. The Gator Nation hates the Seminole Nation and all they stand for and vice versa. There have been some of the finest college football players to ever lace the cleats to play in this rivalry. But I think this game can be summed up best by Coach Bobby himself when he said recently…. If I could remember the last time the Cavaliers won, but I can’t. These two teams were playing each other before Oklahoma was even a state. It’s Stillwater and the Cowboys verses the mighty Sooners of Norman. They despise each other with a passion that can only instate rivals can appreciate. They have accused each other of various dirty tricks over the years…….. Throw the records out the window in this one; it’s always a battle for the ages. There are few games that garner more hard feelings than this game between these two bitter instate rivals…..
hence the name of the game, in case you missed it. The fans of the respective schools can’t agree on anything and disagree about everything. They can’t even agree on how many times they have played the series. But suffice to say this war has been going on since 1893, that’s right I said 1893. The day after the Yellow Jackets defeated his Bulldogs. One whole section in the Paper, blank. You want a long standing rivalry? This one has been going off and on since the 1880’s…. But the game itself is the longest standing uninterrupted series in the South. and it’s no less intense now with Coach Steve at the helm of the Gamecocks and Coach Sweeny with the Tigers. This is one of those rivalries that transcend time and space. you carry this feeling with you going into this week, that cannot be defined or described. It’s about beating “Them”, and being able to enjoy that win for the next year. That my friends; is what a rivalry is all about. In the immortal words of Keith Jackson the voice of college football now and forever. This kind of Hate deserves its own section; The Iron Bowl edition will be out tomorrow. There is more hate and discontent to come.. Your Thanksgiving Edition of the Picks will be out soon….